This lesson will show you how to link a simple contract variation form with a document template. There are three steps in creating a working form, linked to a document template. You can build from the scratch, or modify an existing document template to suit your particular requirements. 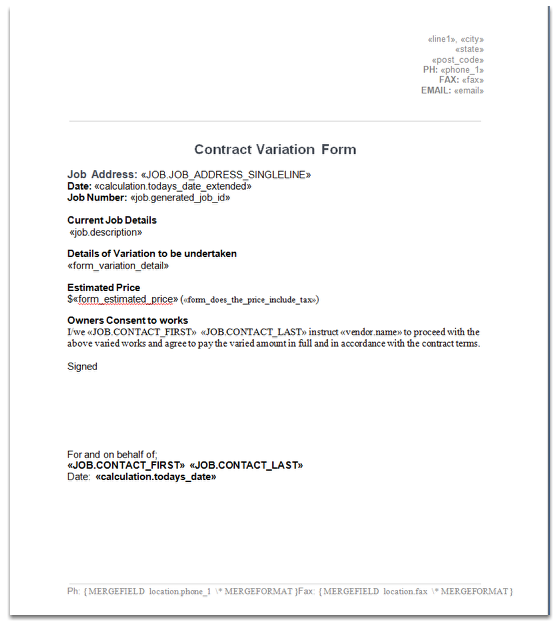 The template above is used as the document for the Contract Variation template. It contains merge fields from the job and merge fields from the form. There is a place for your company logo in the top header section. The address, phone, email and fax details could be replaced with you actual company details. 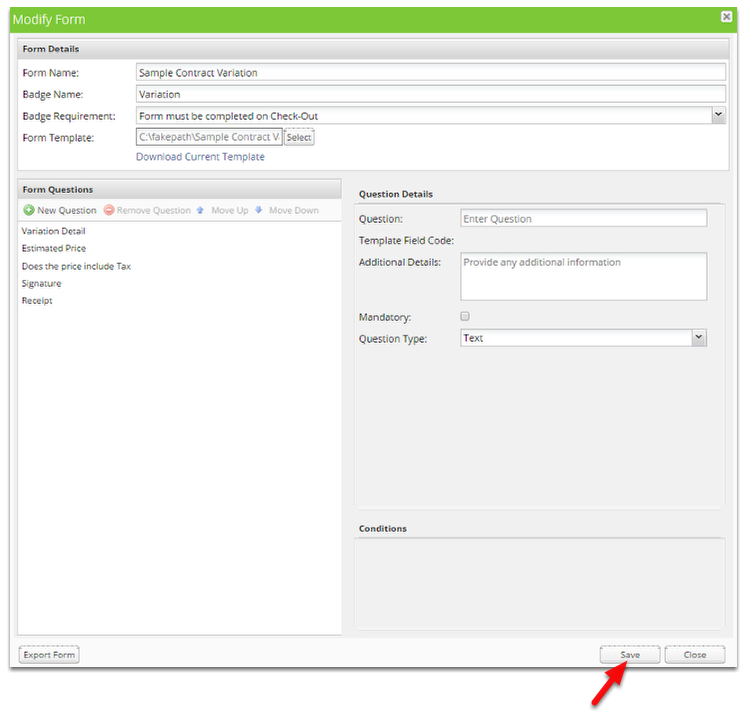 If you do not know how to do this, read the relevant lesson on How do I create a custom invoice/quote/work order template? article. Once completed it will be now ready to be uploaded into the Contract Variation form. If you do not already have a sample form, see the lesson on Creating a simple Contract Variation Form. Leave the form name and the badge name the same as they are. Simply browse and select the contract variation form from your computer and then save the form. NOTE: The badge you have named in your form here appears as a badge on the side of the Job Card. If you add the Form's Badge to a job, the form will appear on the mobile app as a job checklist item. This is a good way to ensure staff are aware that there is a form that needs to be filled in on this job. At the end of this step you have linked your form to the document template. The next step is to place the form answers into your document. TIP: Click the image to enlarge. Using Microsoft Word (version 2007 or later), open the document template that you want to link with the form. Place the cursor on this document where you would like the results of the form template field code to appear and proceed as below. 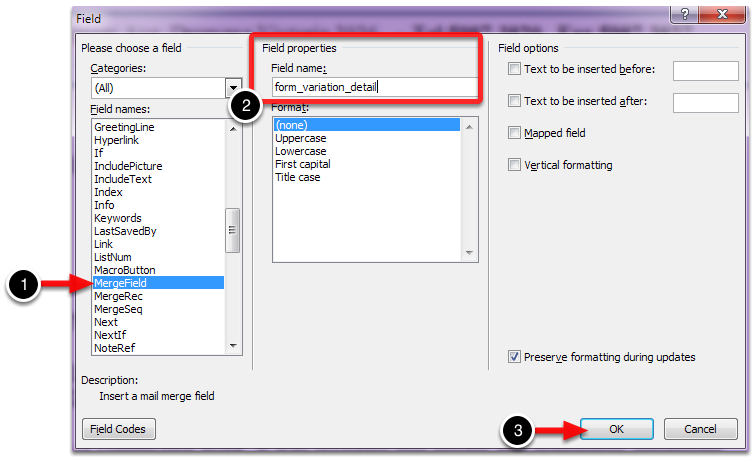 Copy and paste into the Field Properties > Field name textbox the Template Field Code (form_variation_detail). Repeat this process for all Template Field Codes. Save the template and reload it into ServiceM8. Always test your template first before using it on real jobs.